The tool is incredibly simple, and works for sharing files to computers in the same network as you (that is; to all computers that can reach port 8080 on your computer). 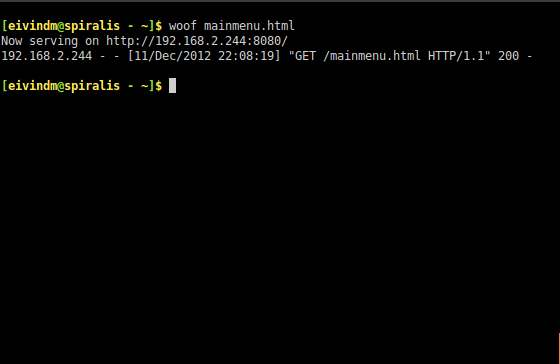 Woof then returns Now serving on http://192.168.2.244:8080/. You can now share this link (for example using an IM). When the user submits the URL in his/her browser, it instantly downloads the content. In the case of a folder, it downloads a tar.gz with the content. 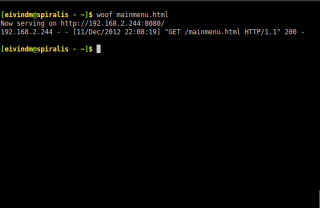 Woof then automatically exits after the content has been downloaded. Simple and effective!